Die Info ist wahrscheinlich nicht ganz vollstaendig, trotzdem sollte es jedem ne Idee geben wie der Ablauf ist. Passapiertickets koennen vorab bei jeder Reiseagentur (ca. $ 58.-) gekauft werden, muss man aber nicht und die Bezahlung fuer das Fahrzeug findet in Sharjah in AED statt. Wir bezahlten bei ihm im Buero direkt 4.450.000.- Rial, mit dem Versprechen dass er die Tickets dann abends in der Abfertigungshalle vorbeibringt. 200m weiter, links blaeuliches Zollgebaeude, wenn man reinkommt -> ganz hinten rechts muss man die Aufmerksamkeit eines Zollbeamten erregen (einfach die Schlange ignorieren), der nimmt das Carnet und sagt ca. 30min warten …. Im naechsten Gebaeude (Abfertigung) links gibts im 2. Stock ne Kantine mit Tagesmenu (2x Fleisch mit Reis plus grosse Flasche Cola 160.000.-) nix besonderes, aber macht satt ! Dann ….. WARTEN und Lesen …..
Mr. Sanchuri (oder so) von der Agency bearbeitet weitere Dokumente, macht Kopien, etc. Achtung: nachdem das Fahrzeug dort steht kommt man nicht mehr ran, d.h. vorher alles was man so fuer den restlichen Tag braucht rausnehmen !!! Umzug in die Abfertigungshalle und wieder warten …. Weil …. nun faehrt erstmal ein Tanklaster rein, weil die Faehre erstmal betankt werden muss (ca. 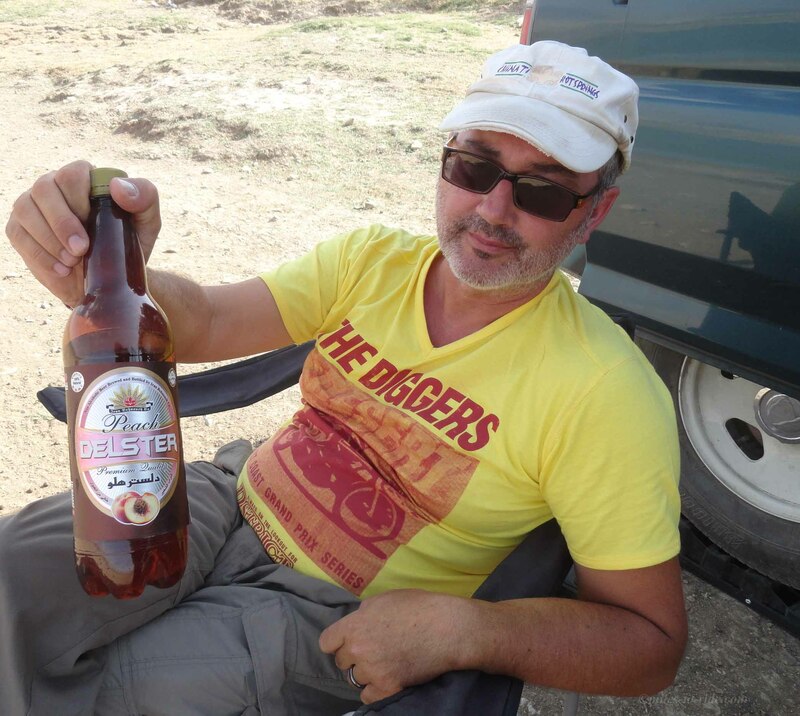 30.000 liter) …. kein Kommentar, die Faehre liegt den ganzen Tag im Hafen …. Agent erwartet uns beim Auto, nimmt das Carnet und ist weg …..
Dann gehts zum Zollgebaeude, d.h.
Erneute Kontrolle der Fahrgestellnummer, dann RAUSFAHREN !!!!! It’s a looooooong day, take enough to eat and drink with you, well slept keeps you going and calm ! This information is probably not complete, but gives you an idea how it’s works. There is no need for a fixer/helper, no bribes and everybody trys to help you. They speak English, but very few words only … but enough for the procedure. You can buy passenger tickets at any agency in the country (US$ 58.- p.p. ), but you don’t have to. You can buy it the day you are leaving and the payment for the vehicle is in Sharjah (AED) anyway. South Sea Shipping Service (2. Floor, left) , we talked the day before about the price, first he wants $700.- for the car (4.60m x 2.00m) … then we agreed on $600.- …a bike is probably half or even less. Next building on the 2.floor is a basic restaurant with a simple meat and rice plate (2x plus 2liter Coke for about 160.000.-) … nothing special, but feeds you ! Attention …. once your vehicle is in the loading zone, you are not allowed to go there again … so get you stuff out and with you .. I drove the car through the security gate and walked back, f…. hot and humid !!! Back to the agent, the bill is AED 2686.- incl. transport, fees for him/paper/stamp … at the immigration building is a ATM and he wants the local currency … he is not very helpful, but likes to take the money …. a..hole , I just did’t like him! show the pass, they check the VIN number again and then OUT !!!! 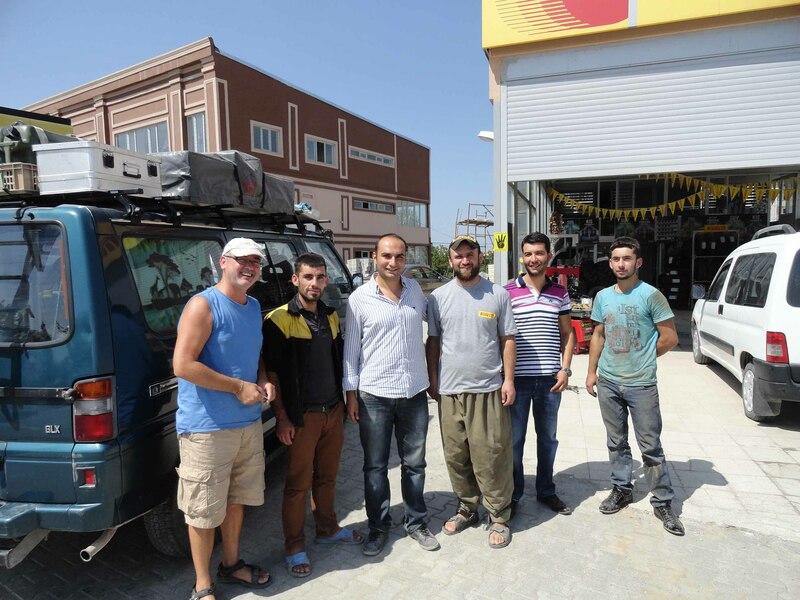 They didn’t check the car or luggage, everything was working OK and easy, for every payment you get a bill and there is absolutely no need for a fixer/helper. No insurance checked or road tax or anything else …. Everybody speaks good English and have good manors ! 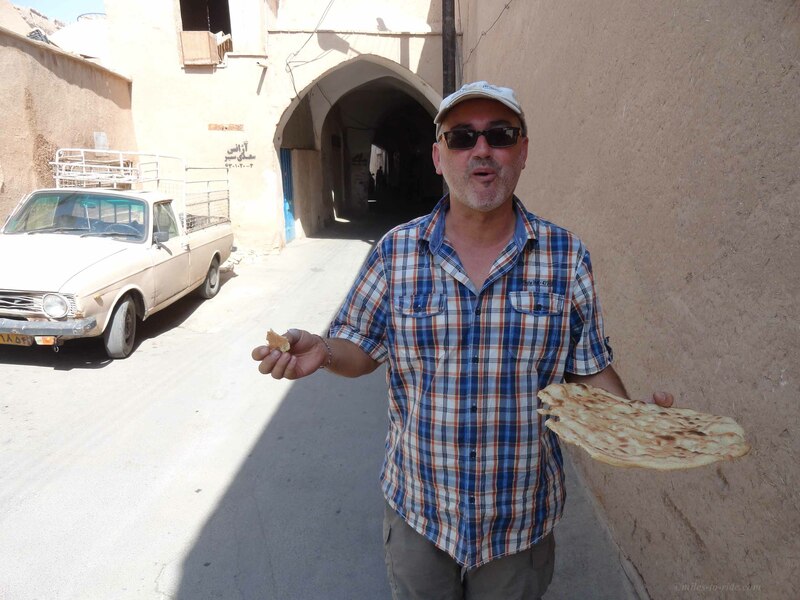 Wir verlassen unser schön klimatisiertes Zimmer in Yazd nach zwei Tagen und fahren über eine karge teils sandige Gegend nach Pasargad. Leider wollen die Iraner auch hier von uns Europäern mehr Eintritt, so dass wir nur in der Gegend übernachten. Zwischenzeitlich fangen wir an, uns über die langen LKW Schlangen vor den Tankstellen zu wundern… werden wir dabei noch später erfahren, dass in gewissen Gebieten eine Dieselknappheit existiert. 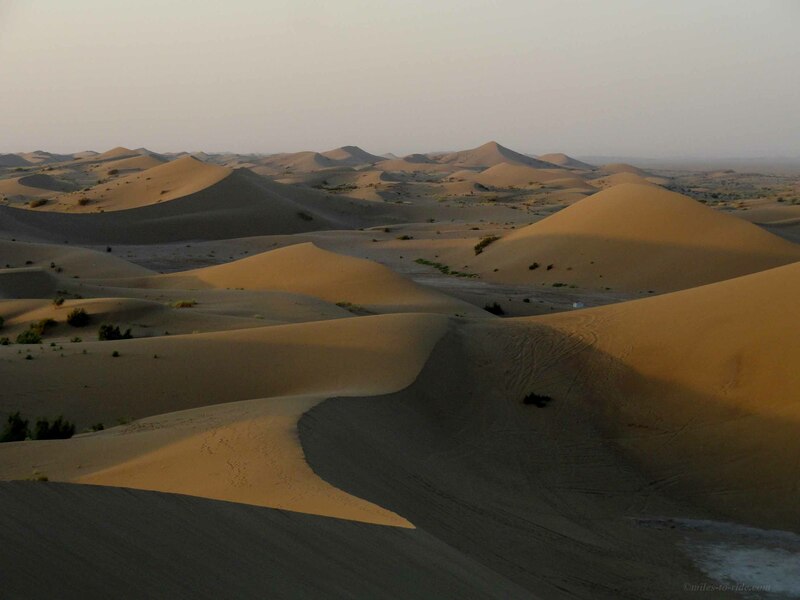 We left our nice air-conditioned room in Yazd after two days and go on passing a great part of Iran to Pasargad. 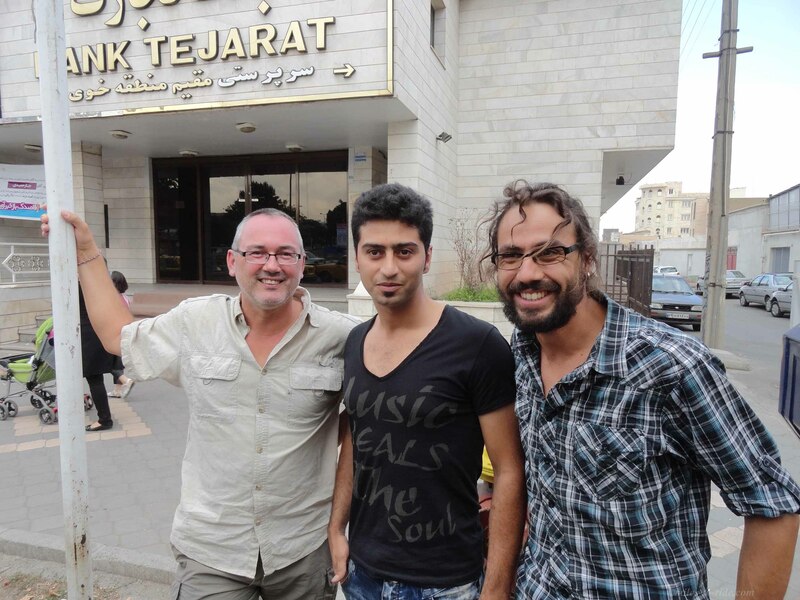 Unfortunately, the Iranians want to have more money from us Europeans as entrance fee, so we just stay in the area overnight. In the meantime, we begin to wonder about the long truck queues at the gas stations … We will thereby learn later that in certain areas there is a diesel shortage. 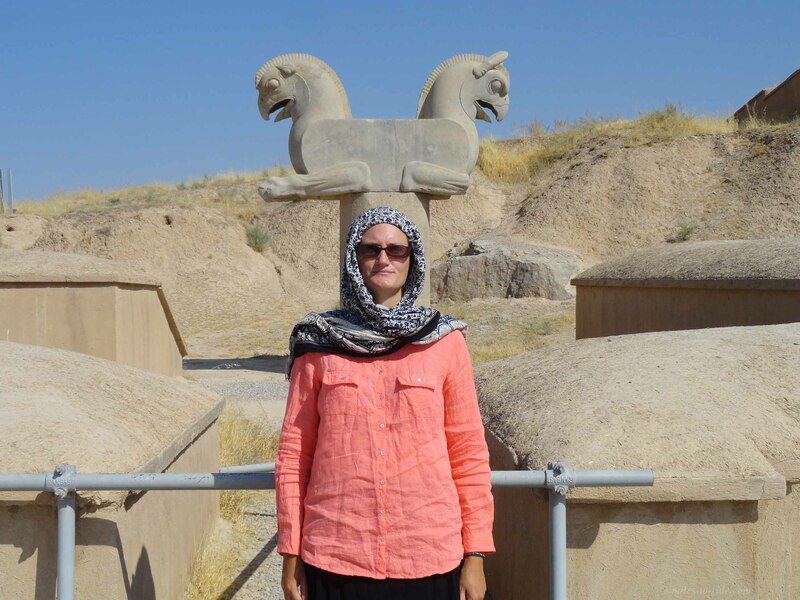 In Persepolis, der altpersischen Residenzstadt (persisch ‏auch Tacht-e Dschamschid „Thron des Dschamschid“ genannt) flüchte ich nach einer Stunde auf dem Ausgrabungsgelände…bereits beim Eintritt verschlägt es mir die Laune, als wir das 5-fache des Eintrittspreises für Iraner zahlen müssen (Iraner: 30’000 Rial, Ausländer: 150’000 Rial). Dann müssen wir durch die Einlasskontrolle und ich werde unhöflich aufgefordert, meinen Trinkrucksack beim Deposit abzugeben, während alle anderen iranischen Frauen mit ihren Handtaschen ganz locker am Typen vorbeilaufen…. da hätte ich am liebsten meine Eintrittskarte zurückgegeben und mein Geld zurückgefordert… aber Persepolis war eine der Hauptstädte des antiken Perserreiches und wir hatten schon interessante Berichte darüber gelesen… also “rein und anschauen” und anschauen hiess es nun! In Persepolis, the ancient Persian city (in Persian also known as Takht-e Jamshid, “Throne of Jamshid”) I flee after an hour on the excavation site … already entering they took my mood, as we have to pay 5-times the admission price than Iranians (Iranians pay: 30,000 Rial, foreigner pay: 150,000 Rial). Then we need get through the entry control and I’m asked in a rude way to leave my drinking backpack at the deposit, while all other Iranian women can enter with their handbags …. 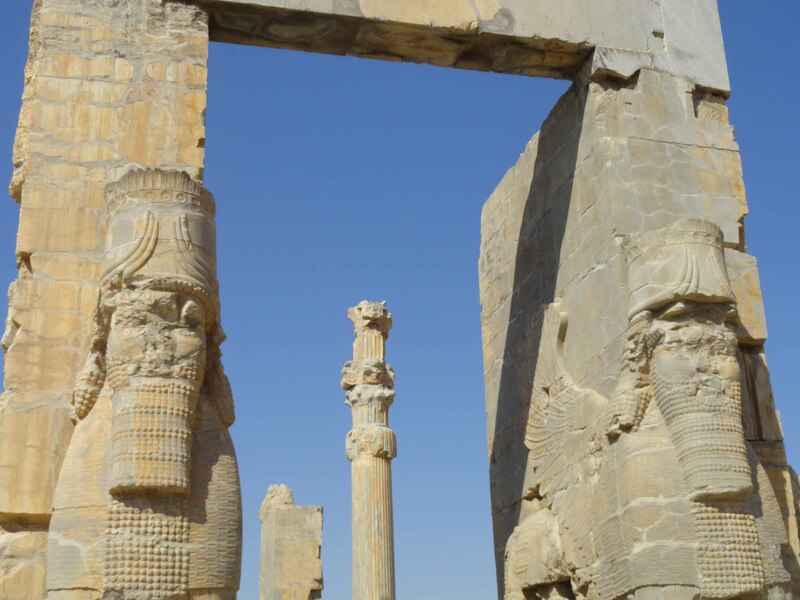 I would have liked to return my ticket and demanded my money back … but Persepolis was one of the capitals of the ancient Persian Empire and we had already read interesting reports about … So “enter and have a look” now! 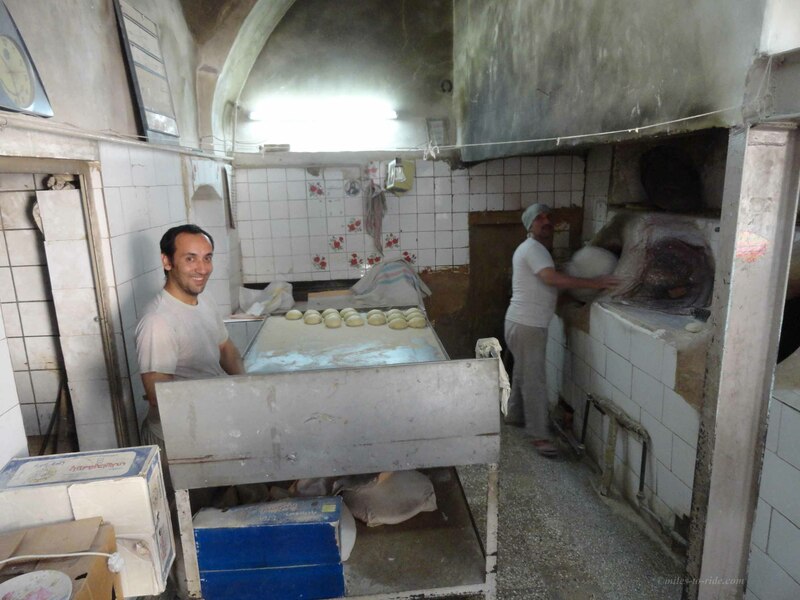 Schon auf den ersten Metern dachte ich, was für ein Fehler… bereits am Eingang der Ausgrabungen reihten sich die iranischen Touristen in Gruppen zusammen und nicht, dass wir die einzigsten Ausländer wären, doch so bin ich selbst in Asien nicht angestarrt worden… nicht heimlich oder schüchtern wurde mal ein Blick riskiert, sondern ich wurde am laufenden Band von allen sowohl Frauen als auch Männern angestarrt, ja richtig angestarrt…Thomas meint, es liege an meiner Grösse, aber auch in Asien oder Südeuropa bin ich mit meiner Körpergrösse von 1,83m eine grosse Frau … aber die mehr als neugierigen Blicke hatten mich an diesem Tag sowas von gestört, dass wir fluchtartig das Gelände verliessen und als dann Thomas für einen Fruchtshake knapp 1,50 Euro zahlen sollte, wo doch der ältere Mann für seine drei Shakes nicht annähernd soviel bezahlt hat, war ihm auch die Lust an weiteren “Sehenswürdigkeiten” vergangen. Stattdessen fuhren wir auf einer Wahnsinnsbergstrecke gen Süden zum persischen Golf. 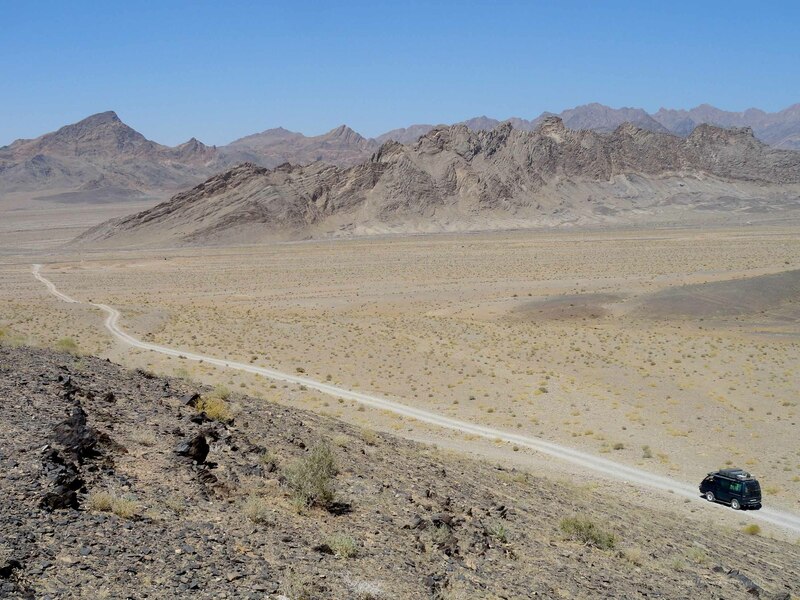 Es sieht aus wie in den Canyonlands in Utah, die kleinere gut ausgebaute Strasse schlängelt sich durch hoch aufragende Felswände bergab auf Meereshöhe. Already at the first meters I thought, what a mistake … at the entrance of the excavations, the Iranian tourists lined up in groups and not that we were the only two foreigners, but I have not been staring at more even in Asia … secretly or not a shy glance was risked at times, but I was staring at from all – women as well as men, yes really staring … Thomas thinks it’s due to my height, but also in Asia and Southern Europe I am a tall woman with my body height of 1.83 m … but more than curious glances has bothered me that day the most and we hastily left the area and then as Thomas should pay nearly € 1.50 for a smoothie, while the older man infront of him paid for his three shakes not nearly as much, also Thomas didn’t want see more “sights”. 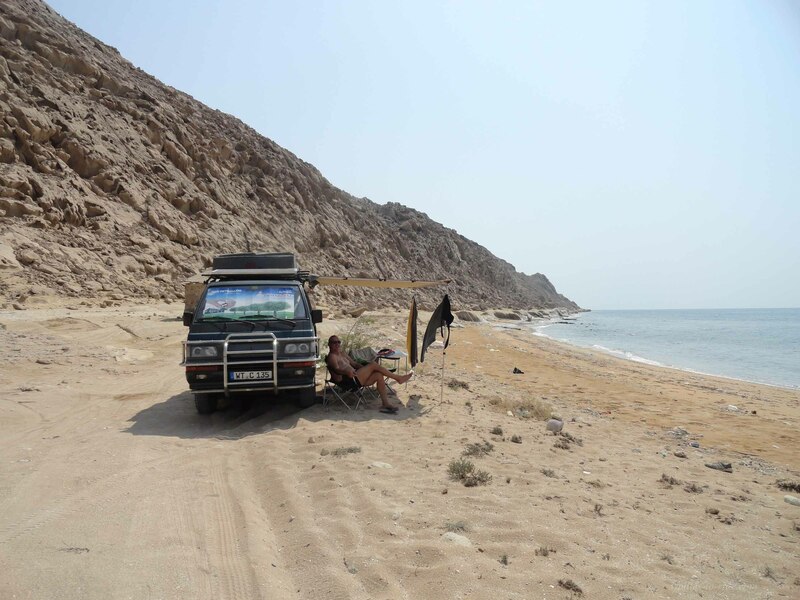 Instead, we went on to a great mountain route south to the Persian Gulf. It looks almost like in the Canyonlands in Utah, the smaller good road winds through towering cliffs down to sea level. Bei der nächsten möglichen Dieseltankstelle fahren wir wieder mal frech an der langen Schlange an LKW’s vorbei direkt vor die Zapfsäule und bekommen unseren Kleenen gott sei Dank nochmal vollgetankt, denn, wie wir erfahren, aufgrund des illegalen Schmuggels im persisch-arabischen Golf in die Emirates besteht eine Dieselknappheit, ausserdem gibt es zuviele alte Diesellaster, die ohne Ende den Sprit verschlucken oder nur in schwarzen Rauchwolken rausblasen. Wir haben jedoch Glück und ein netter iranischer Trucker leiht uns seine Tankkarte und wir bekommen wieder einmal zum einheimischen Preis unseren Kleenen vollgetankt. At the next possible petrol station we are keen enough to go around the long line of trucks waiting in line, and go directly to the front of the pump and get our little one refueled, because as we learn there is a diesel shortage due to the illegal trafficking in the Persian-Arabian Gulf in the Emirates, also there are too many old diesel trucks that swallow without end the fuel or blow out only black clouds of smoke. However, we are lucky and a nice Iranian Trucker lends us his fuel card and once again we get our tank full to the local price. And now we know the price for two people is 3’200’000 Rial … ok, slightly less than the listing of the Iranian Travel Agency. But when it comes to the price of the car, the guy is typing a figure in his calculator – it seems like a whim from any number and says we have to pay in Sharjah and in Dollars … $ 700…wow … Thomas had researched on the internet several prices, but we were hoping that it does not have to come to such negotiations … well, when we began to argue that our car is so small etc. .. he just said, the boss is in Tehran and comes back tomorrow and we have to deal with him tomorrow … ie without result, cause we have neither a ticket for tomorrow’s ferry, nor do we have an exact price commitment for the entire ferry fair… We just hope that tomorrow will be sufficient time for us to get tickets for us as well as for our little one and then get both us and the car stamped out of the country before the ferry takes off at 9 p.m.
Wednesday morning off we went to the shipment company… how it worked and how we got to Sharjah, one of the 7 Emirates of the United Arabic Emirates… we will write soon!!! 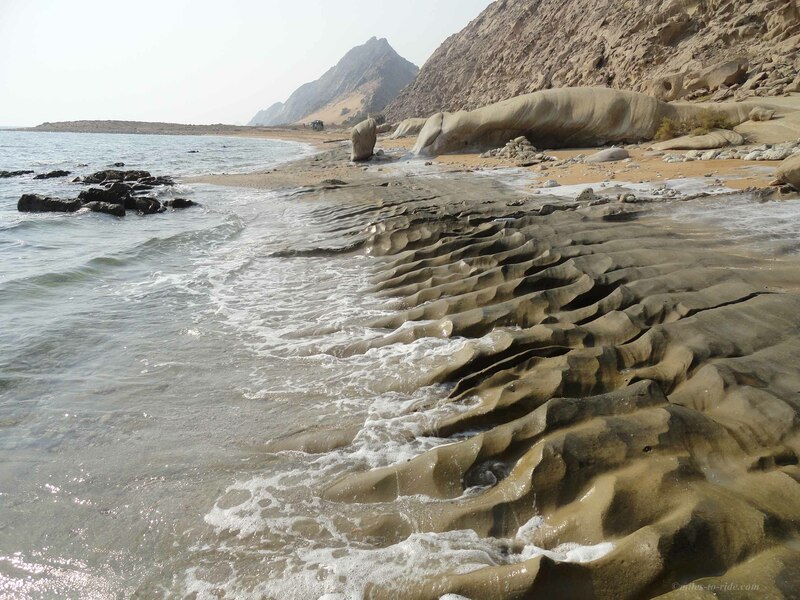 here are the first pictures of Iran – northwestern part! 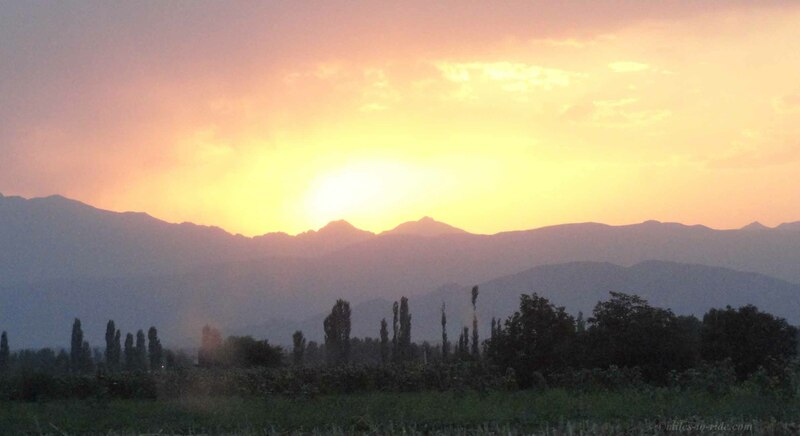 here are the pictures of – central Iran! 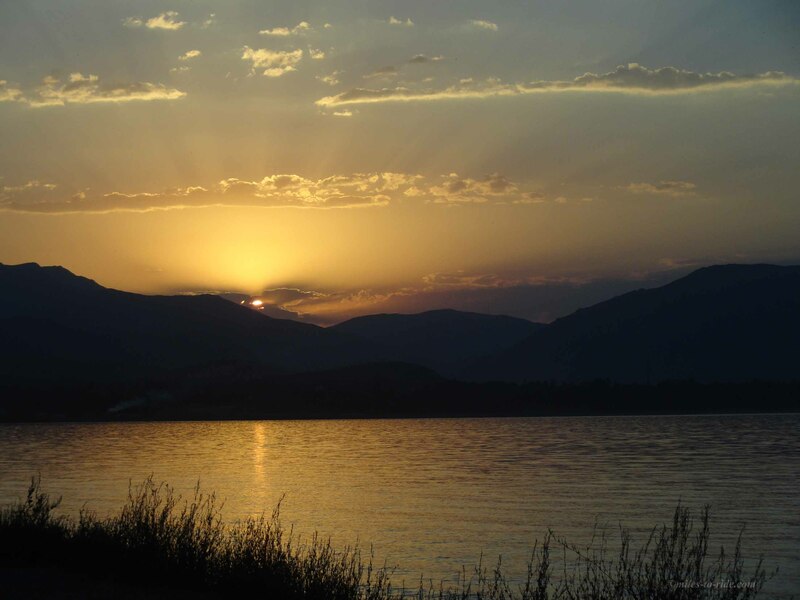 Güle, Güle Turkey – Salam Iran!!! Leider mussten wir feststellen, dass der geflickte Reifen nicht mehr brauchbar war, denn die Carcasse war durch das Fahren derart zerstört, dass wir beim nächsten Oto Lastik das Ersatzrad draufmontierten, die hinteren Reifen nach vorne wechselten und einen gebrauchten alten Reifen der Werkstatt als Ersatzreifen mitnahmen…. das alles für sage und schreibe 50 Türkische Lire (ca. 20Euro). Unfortunately we noticed that the repaired tire was no longer usable because the Carcasse was destroyed in such a way that we now have the spare wheel mounted at the next Oto Lastik, the rear tires changed to the front and we took a used old tire from the shop to replace the other spare tire …. all for a whopping 50 Turkish liras (about 20 euros). Die letzten Essenseinkäufe erledigt ging es am 1. September morgens zur Grenze nach Kapiköy. Damit es zu keinen Diskussionen kam, hatte ich mir bereits im Auto das Kopftuch aufgesetzt und so fuhren wir an den Grenzposten heran. Die Ausreise dauerte länger als erwartet, da keiner sich anstellte, einem irgendetwas zu erklären. Die Passkontrolle verlief ohne Probleme, doch da der Kleene bei Thomas im Reisepass registriert war, musste er insgesamt an drei verschiedenen Stellen vorbei und das Fahrzeug im Pass ebenfalls ausstempeln lassen. The last food purchases done it was on 1 of September when we went to the border at Kapiköy. 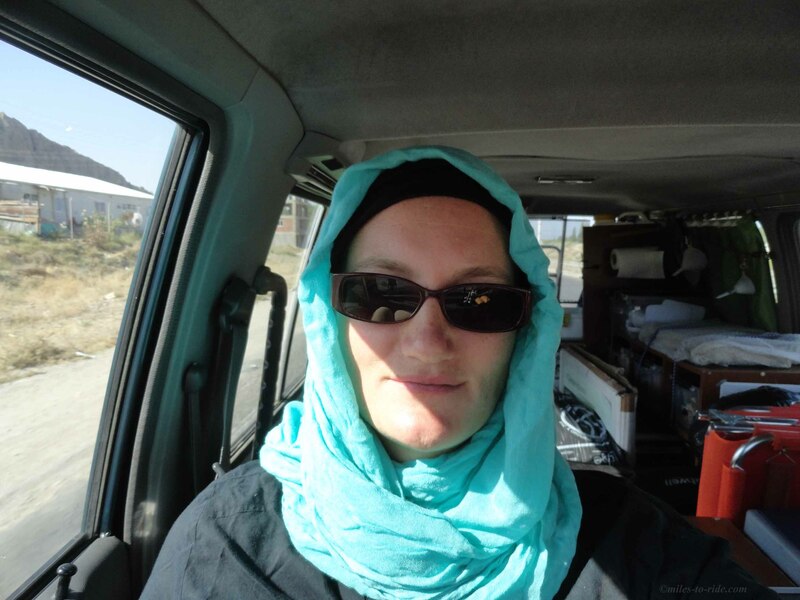 Thus, there will be no discussions, I had already put on the scarf in the car and we drove up to the checkpoint. The departure took longer than expected because no one appeared to explain the proceedure to us. The passport control went smoothly, but as the little one was registered in Thomas’ passport, he had to pass a total of three different places and finally also our vehicle was stamped out. 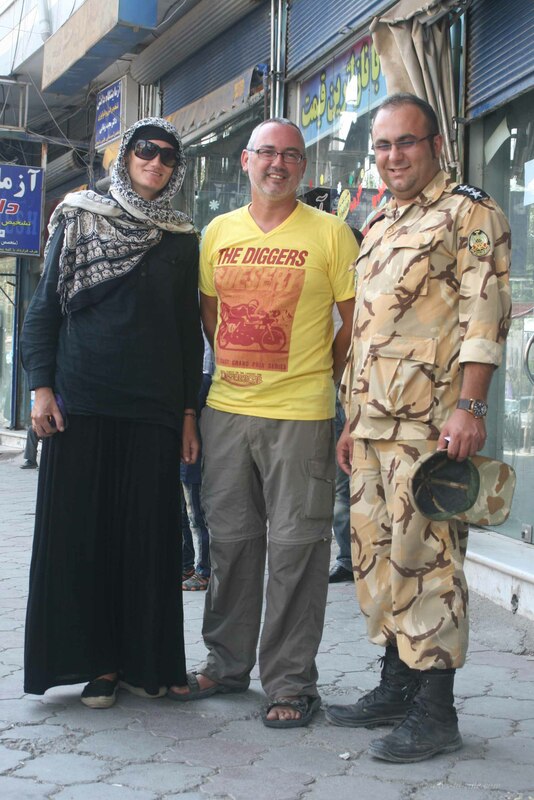 Währenddessen hatten wir bereits die Aufmerksamkeit sämtlicher Iranischen Touristen erregt und wir wurden sogleich nach Urimhye (ca. 200 km südlich) eingeladen. Die Einreise in den Iran verlief dahingegehend ohne Probleme, unser Pässe wurden genauestens studiert und wir gemustert. 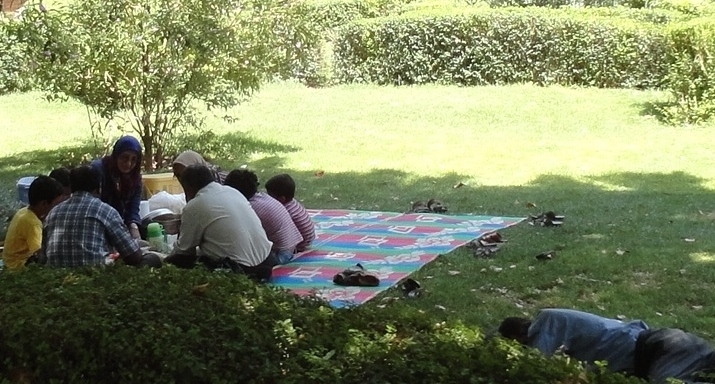 Eine nette Englischlehrerin aus Esfahan fing im Wartesaal ein Gespräch mit mir in Englisch an und da wusste ich, Iran wird sicher toll, aber auch anders werden, denn keiner der männlichen Anwesenden hat sich mir auch nur genähert. Meanwhile, we had already attracted the attention of all Iranian tourists and we were immediately invited to Urimhye (200 km south). The entry into Iran was without any problems, our passports were carefully studied and we watched. 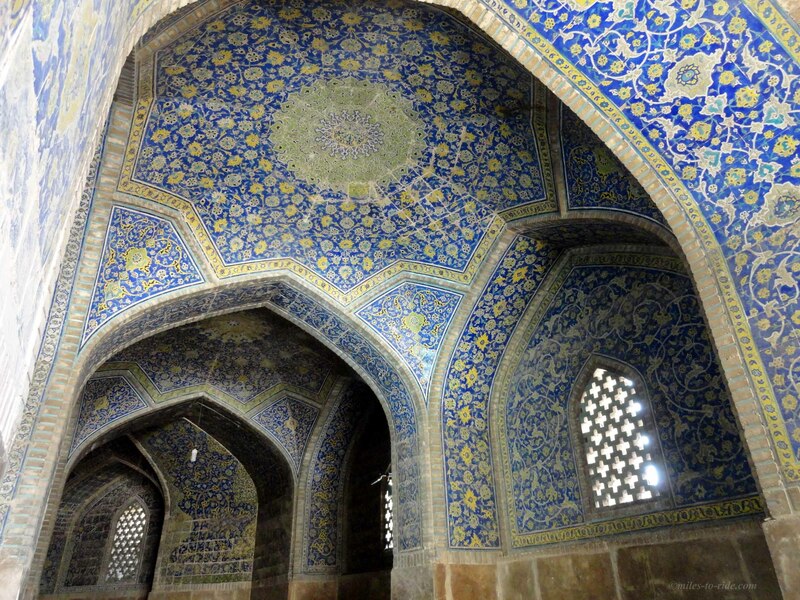 A nice English teacher from Esfahan began a conversation with me in English in the waiting room, and at that moment I knew that Iran will be different but certainly great, because none of the male audience has even approached me. Unser Carnet wurde mithilfe eines Grenzbeamten abgestempelt und wir konnten mit unserer mitgeführten internationalen Versicherung dem Bezahlen einer zusätzlichen iranischen Versicherung entgehen. Keiner hat von uns eine Dieselsteuer verlangt. Wir hatten bereits von einem italienischen Päarchen davon gehört, dass sie mithilfe eines Fixers und etwas Bakshih am Grenzübergang in Dogubayazit keine Dieselsteuer zahlen mussten… für uns etwas neues, da wir als Motorradfahrer uns über so etwas ja nie Gedanken machen brauchten… wir blieben verschont und nach einem kurzen Blick in das Wageninnere, was sich eher als Alibiübung anfühlte, konnten wir nach knapp 1,5 Stunden in den Iran einreisen. 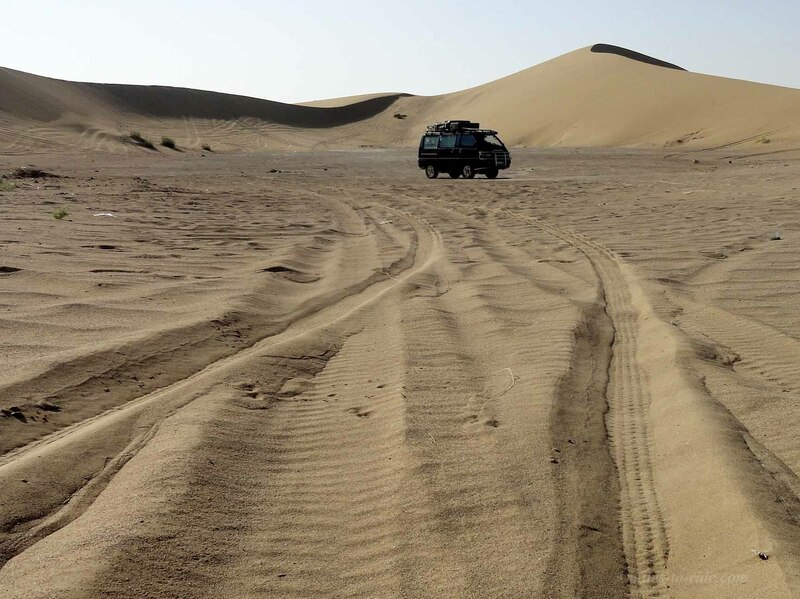 Our carnet was stamped with the help of a customs officer and we could escape the payment of an Iranian insurance using our international insurance paper. No one has asked us to pay any diesel tax. We had already heard from an Italian couple that they use a guy (so-called Fixer or helper) and Bakshish at the border crossing in Dogubayazit that they would not have to pay a diesel tax … something new for us because we as motorcycle travelers never needed to think about something like this … We were spared, and after a quick glance into the car, which felt more as an exercise, we were able to cross the border to Iran just under 1,5 hours. 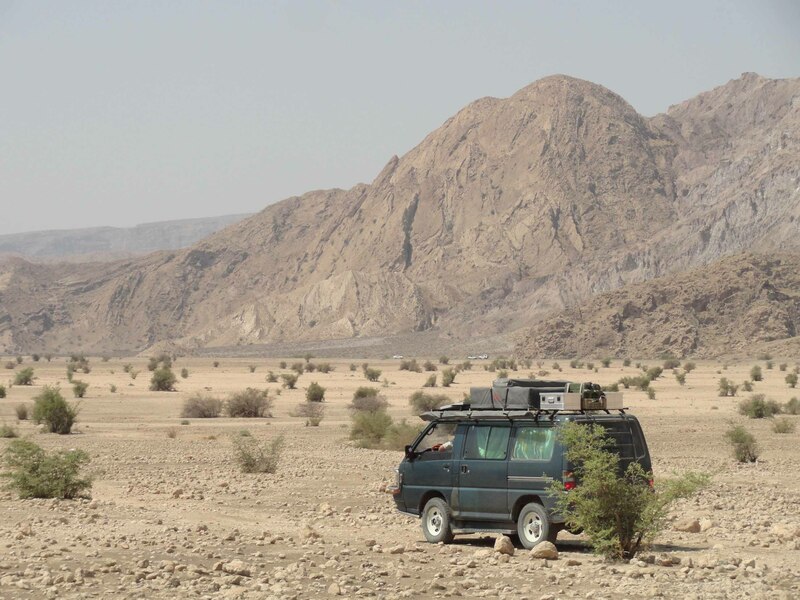 In Khoy können wir zum ersten Mal auch den bisher billigsten Diesel auf der Reise tanken, ganze 0,09 Euro zahlen wir für den Liter und zahlen dennoch mit 3500 Rial für den Liter ganze 2000 Rial mehr als der Einheimische – sozusagen der Touristenzuschlag! Bei knapp 2,50 Euro für einen vollen Tank, beschweren wir uns nicht… wenn man Glück hat, kann man auf der Tankkarte eines LKW Fahrers mittanken und muss eventuell nur 1500 Rial für den Liter bezahlen. Meistens aber wissen die Tankstellenbesitzer, dass man als Ausländer mehr als den doppelten Preis bezahlen muss. An wen wir den dann zahlen, steht in den Sternen, denn die Tankanzeige ist immer noch auf 1500 eingestellt, zahlen müssen wir aber 3500… wir betrachten es dann als Unterstützung der Einheimischen! 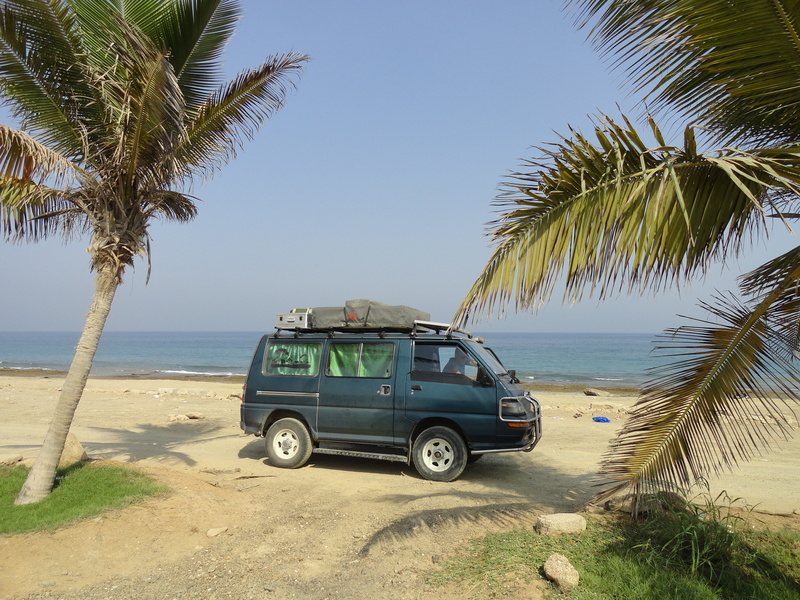 In Khoy we can fill up our tanks with the cheapest diesel on the trip so far, we pay 0.09 Euros per liter and pay with 3’500 Rial per liter yet 2’000 Rial more than the locals – so to speak, the tourist tax! At just 2.50 Euros for a full tank, we do not complain … if you’re lucky, you can communicate to refuel the tank with the diesel card of a truck driver and may need to pay only 1’500 Riyal per liter. But most gas station owner know that you have to pay more than double the price as a foreigner. To whom do we pay then,it’s in the stars, because the fuel gauge is still set to 1500 Rial, but we have to pay 3500 … then we consider it as a support of the locals! 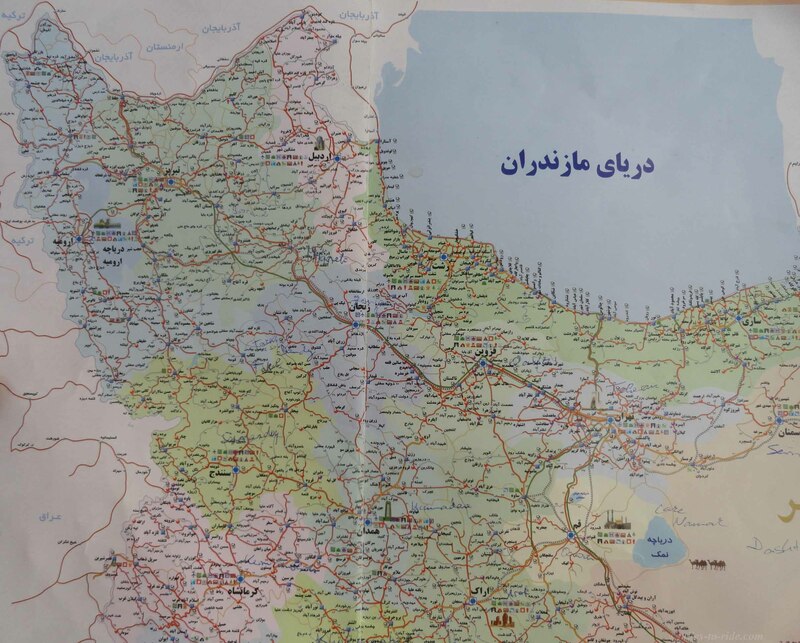 In der nächstgrösseren Stadt Tabriz versuchen wir unser Glück auf der Suche nach einer lesbaren Strassenkarte, aber leider erhalten wir in der sogenannten Touristeninformation nur eine Karte auf Farsi…nun denn, was soll’s … wir kaufen noch etwas frisches Fleisch vom Metzger und Gemüse auf dem Markt, machen Sightseeing der Blauen Moschee und suchen uns anschliessend einen netten Übernachtungsplatz ausserhalb der Stadt. In the nearest major city Tabriz, we try our luck at finding a readable roadmap, but unfortunately we get only a Farsi map at the so-called tourist information … well, what the h …we buy some fresh meat from the butcher and vegetables at the market, go sightseeing at the Blue Mosque and search for a nice place to stay overnight outside of the city. 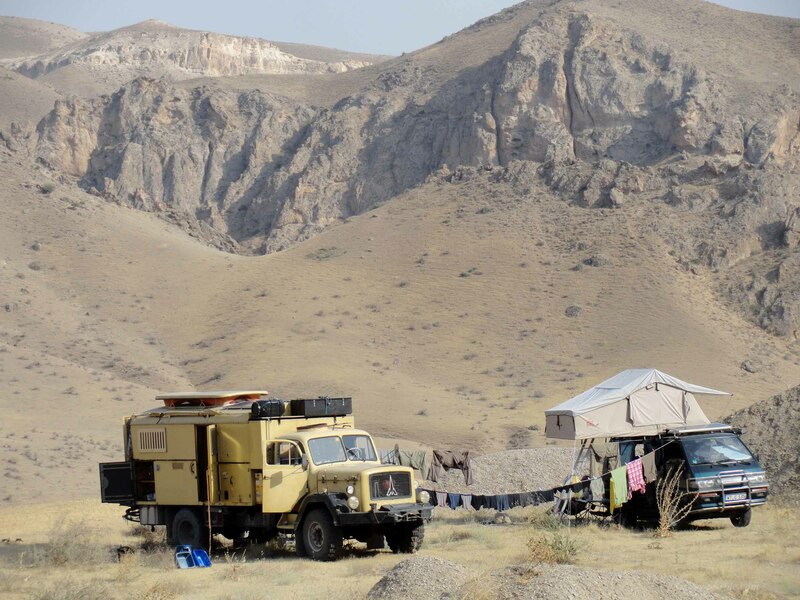 Campingplätze gibt es im Iran keine, also stellen wir unseren Kleenen einfach dahin, wo es uns gefällt… viele Motorradreisende schwärmten von den Picknickplätzen in den Städten, wo man meist auch sehr schnell Kontakt zu den Einheimischen gewinnt… die Iraner sind ein echtes Picknickvolk. Egal wo, es wird sich am Strassenrand auf den mitgebrachten Teppich gesetzt und Wasser, Tee, Essen oder sogar der Grill herausgeholt und für Stunden dort geplauscht oder einfach nur im Schatten gelegen und sich ausgeruht…. für uns ist dies leider keine so gute Alternative zu Campen, denn diese Parks sind entweder genau mitten im Getümmel und uns um einiges zu laut oder genau an einem Kreisel am Anfang der Stadt… man kann mit dem Auto auch nicht in die Parks hineinfahren, sondern müsste am Strassenrand parken. 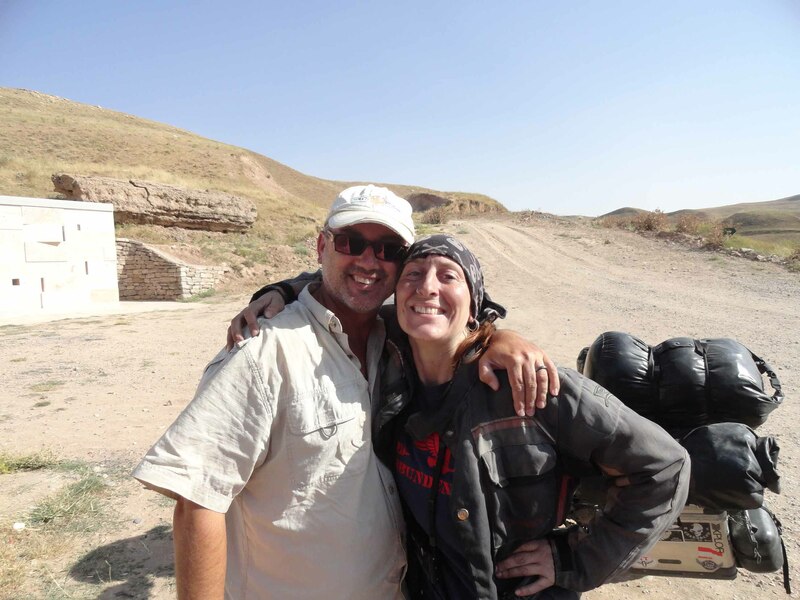 There are no campsites in Iran, so we camp with our little one just simply anywhere … many motorcyclists are mentioning the picnic areas in the cities, where they could camp for a night and where you are very quickly in contact with the locals … The Iranians are real picnic people. 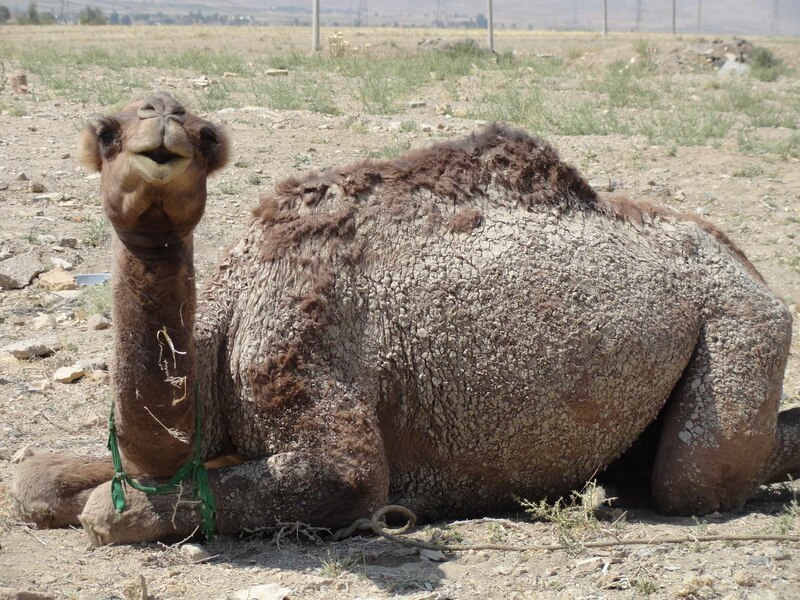 No matter where they sit on the roadside on their carpets and bring their water, tea, food or even taken out the barbecue grill and chatt for hours there, or simply lay in the shade and have a rest …. 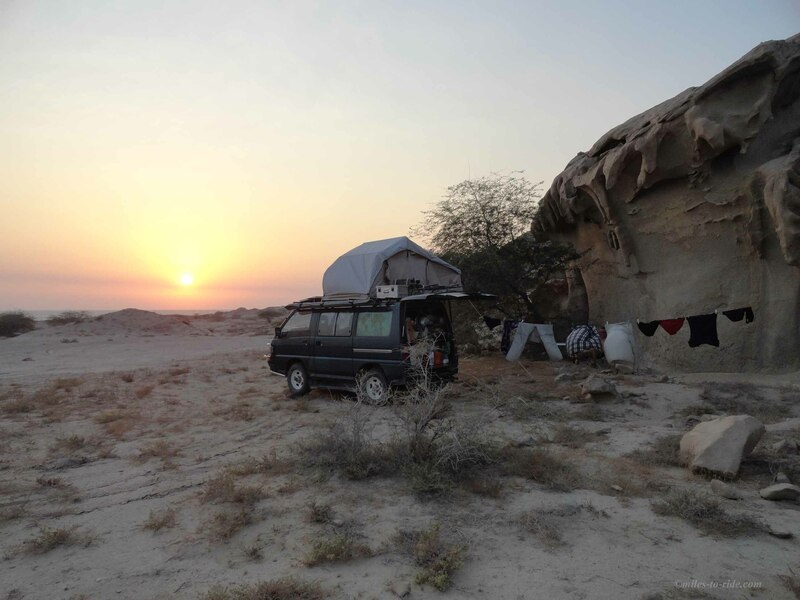 Unfortunately for us, this is not a good alternative to camping because these parks are either exactly in the middle of the town and too loud for us or just in a circle at the beginning of the city … you can not drive your car into the park, but would have to park on the roadside. Am 4. September verabschieden wir uns vorerst von den Magirus Nomaden und setzen unseren Weg gen Takht-e-Soleyman fort, denn wir haben eine Verabredung, auf die wir uns schon lange freuen. 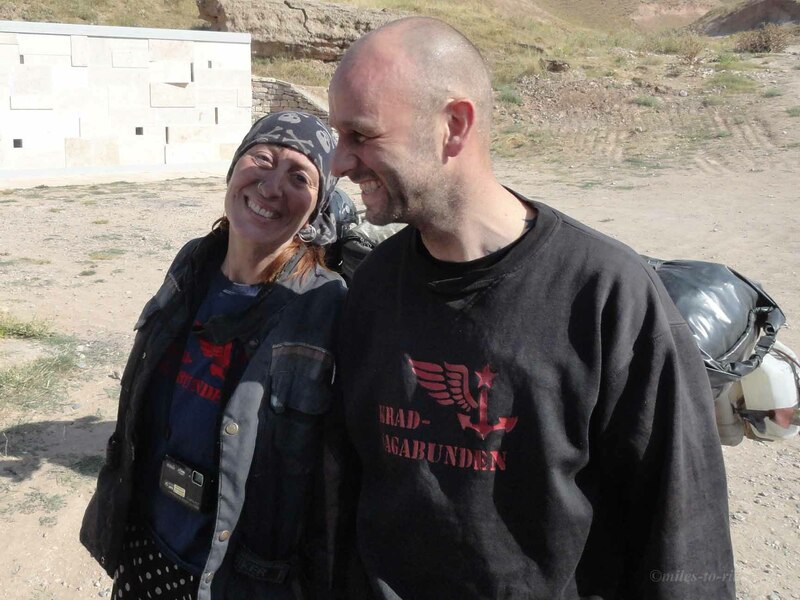 Panny und Simon, die Krad-Vagabunden, mit denen wir bereits seit Jahren in Kontakt stehen und die wir in Kambodscha im Februar das letzte Mal gesehen haben, sind auf ihrem Rückweg von Asien durch Indien, Pakistan und nun im Iran… es wird ein tolles Wiedersehen, viele Geschichten und Anekdoten werden ausgetauscht und schon ist’s wieder Zeit für die Verabschiedung “bis zum nächsten Mal”. Ein Dank an die beiden für die tollen Informationen und ganz wichtig für uns… endlich eine tolle lesbare Strassenkarte. Das macht das Reisen in diesem fremden Land doch um einiges einfacher. 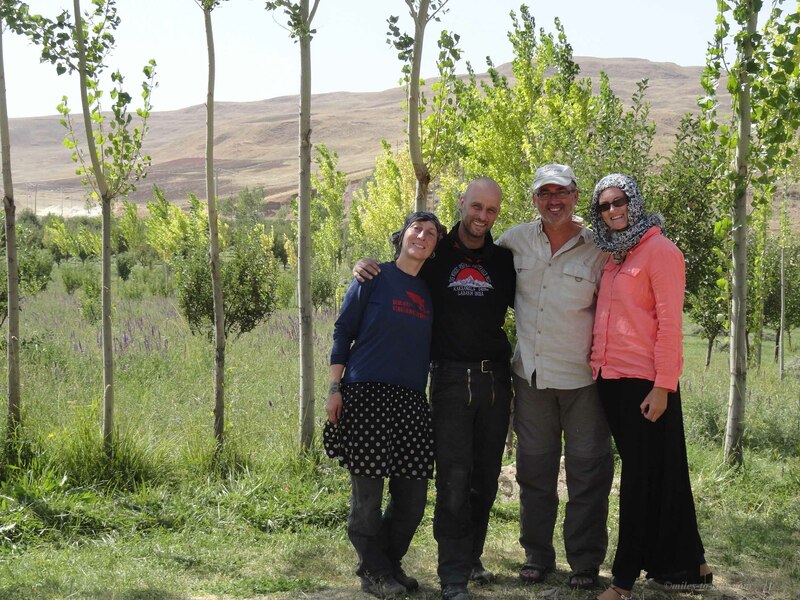 On 4 September, we say goodbye for the time being to the Magirus nomads and continue our route to Takht-e Soleyman, because we have an appointment we have been looking forward to for a long time now. Panny and Simon, the Krad-Vagabunden with whom we are in contact for years and which we have met the last time in Cambodia in February this year, are on their way back from Asia through India, Pakistan and now Iran … it has been a great reunion, many stories and anecdotes have been exchanged and soon it was time to say goodbye again “until next time”. A thanks to the two of them for their great information and very important for us … for their great readable roadmap. This makes traveling in this foreign land much easier for us. Der Westen des Landes ist wohl der fruchtbarste Teil und wir fahren Kilometerlang vorbei an gelben und braunen Weizen- und Ackerfeldern. Die Hitze nimmt immer mehr zu, aber wir finden immer wieder nette Plätze an Seen und Flüssen zum Übernachten. 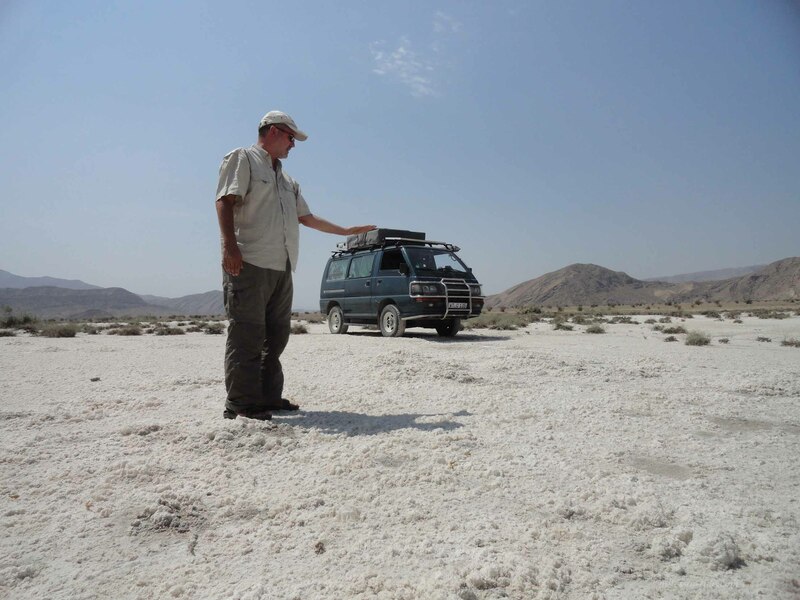 Im Land der Trockenheit und Wüstenregionen scheinen die Einheimischen ständig vom Wasser angelockt zu sein wie wir, denn wir sind nirgends allein und werden immer mit “Hello, welcome to Iran” – “hello, where you come from” angesprochen…. ein längeres Gespräch war bisher mangels weitergehender Sprachkenntnisse nur selten möglich. The west of the country is probably the most fertile part and we drive for miles past the yellow and brown wheat and arable fields. The heat is on the rise, but we always find nice places to stay for the night at lakes and rivers. In the land of drought and desert regions, the locals always seem to be attracted to the water as we are, because we are never alone and always addressed with “Hello, welcome to Iran” or “hello, where do you come from” ….unfortunately, a longer conversation has only been rarely possible due to the lack of further language skills. 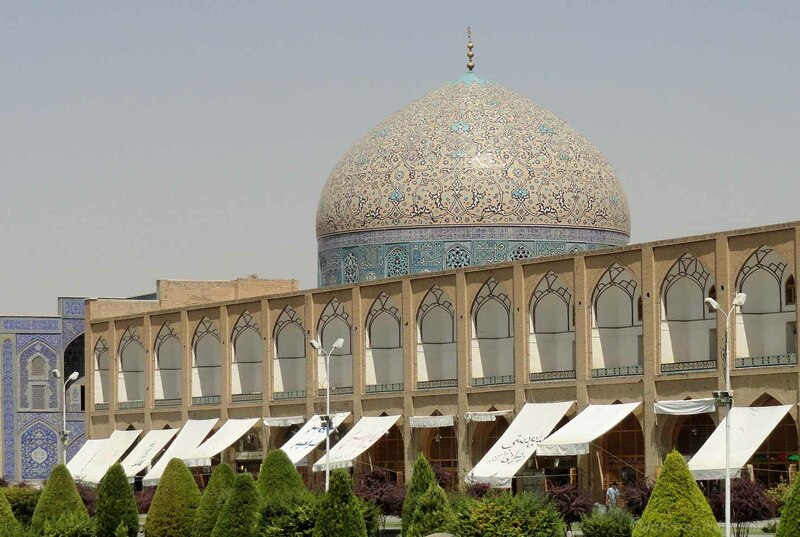 In Esfahan verbringen wir nur wenige Stunden mit Sightseeing – der Platz des Iman mit seinen Moscheen und Minaretts sowie den Handwerkerläden gefallen uns gut, jedoch das Verkehrschaos und die Parkplatzsuche hinterlassen einen kleinen bitteren Nachgeschmack…wir sind uns einig, keine grösseren Städte mehr…statt dessen fahren wir nach südlich von Varzaneh (Danke für den Tipp, Simon!) und geniessen die erste Nacht im Dünenfeld… unsere frisch gewaschene Wäsche (mittlerweile nutzen wir eine Plastiktonne mit Wasser und Waschmittel gefüllt, die durch das Rütteln des Autos wie eine Waschmaschine funktioniert) trocknet geschwind im Wind und der Sonnenuntergang sowie -aufgang am nächsten Morgen sind atemberaubend… welcome to Iran! In Esfahan we spend only a few hours of sightseeing – the place of Iman with its mosques and minarets and the craft shops is really nice, but the traffic chaos and finding a parking lot leaves us with a bitter aftertaste … we agree, no major cities from now on, but instead .. we drive south of Varzaneh (Thanks for the suggestion, Simon!) 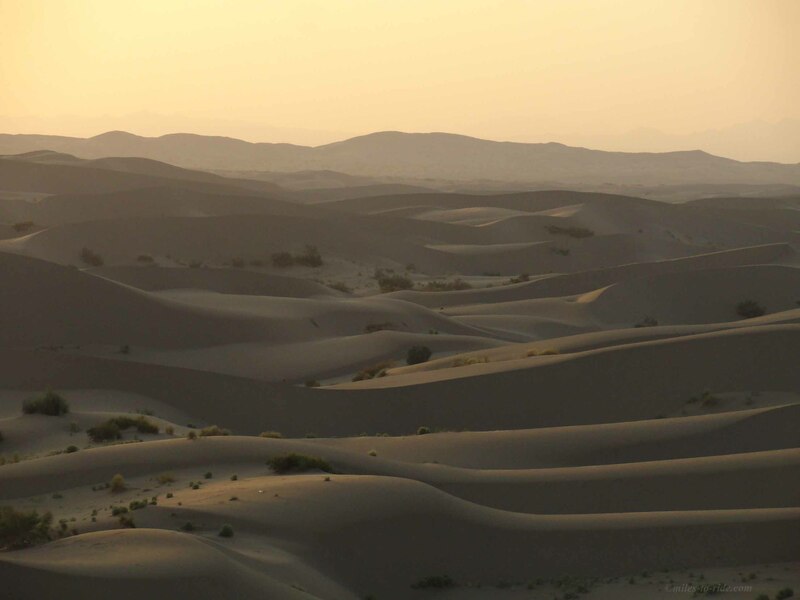 and enjoy the first night in a sanddune field … our freshly washed laundry (now we use a plastic barrel filled with water and detergent that by shaking the car works like a washing machine) dries quickly in the wind and the sunset and sunrise the next morning are breathtaking … welcome to Iran! 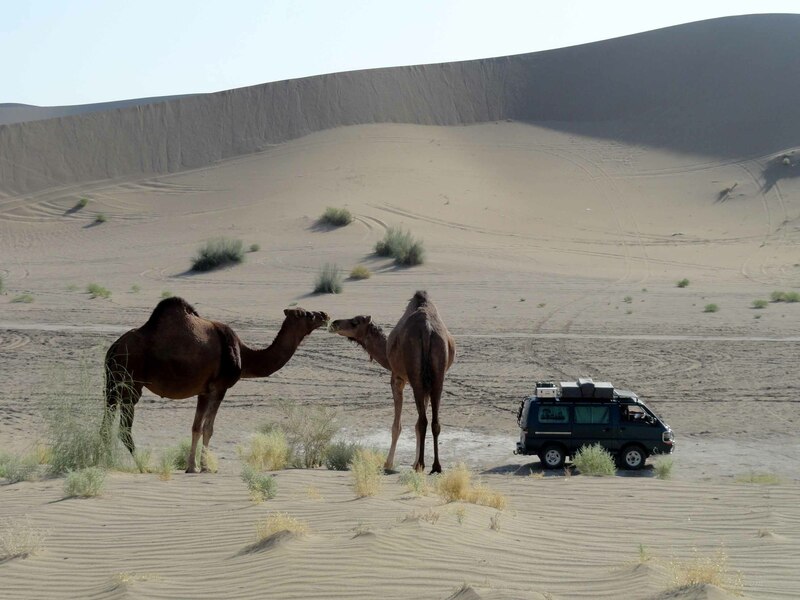 Wir fahren über Ardakan, Check Check nach Yazd und geniessen für drei Tage eine heisse Dusche und Bett im alten Silk Road Hotel. Die erste Nacht mussten wir noch im Zelt vor dem Hotel übernachten, da kein Zimmer frei war und konnten so einen tollen Blick auf die Jameh Moschee geniessen. 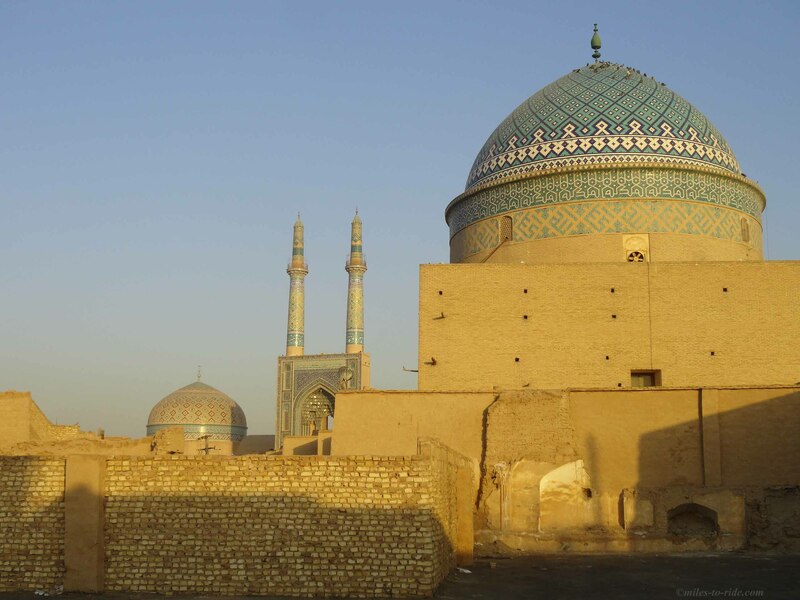 Yazd soll eine der ältesten bewohnten Städte der Welt sein, naja jedenfalls sind die kleinen Gässen und Gässchen der Altstadt mit den kleinen Lehmhäusern sehr beeindruckend und andersartig. 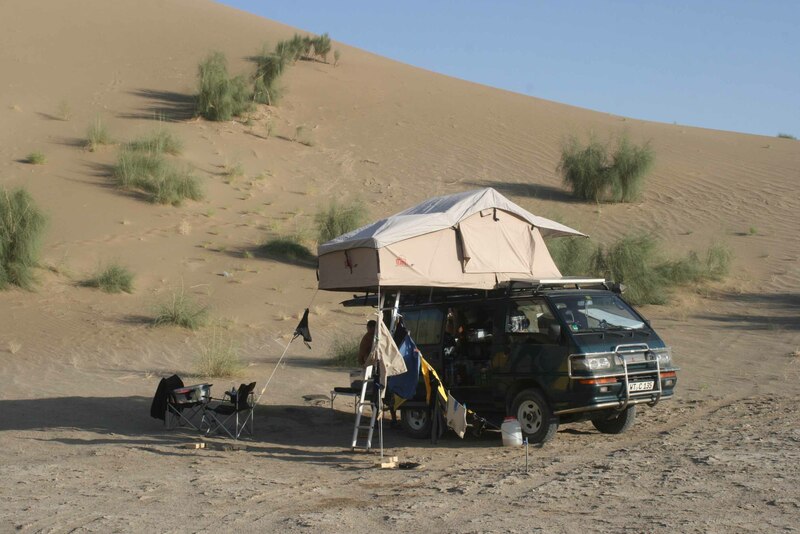 We drive passing Ardakan, Check Check to Yazd for three days and enjoy a hot shower and bed at the old Silk Road Hotel. 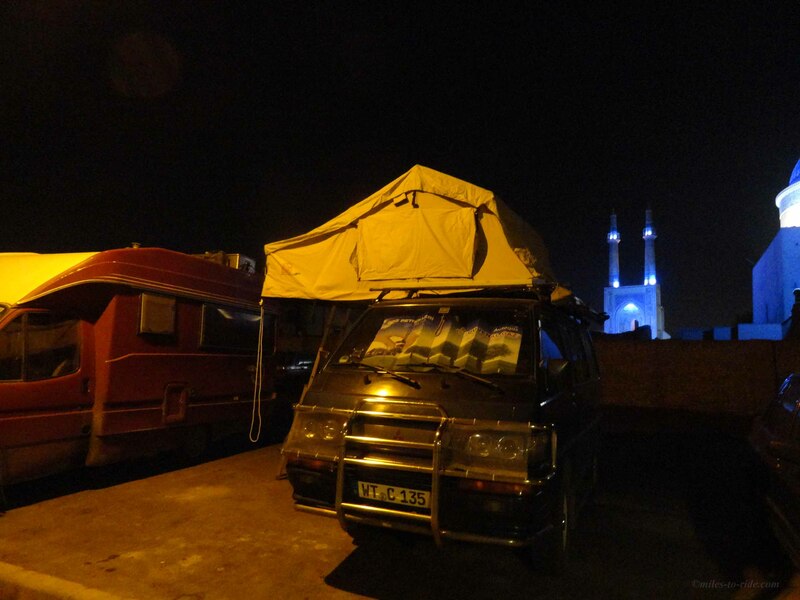 The first night we still had to stay in our tent outside as the hotel had no rooms available and we were able to enjoy a great view of the Jameh mosque at night. 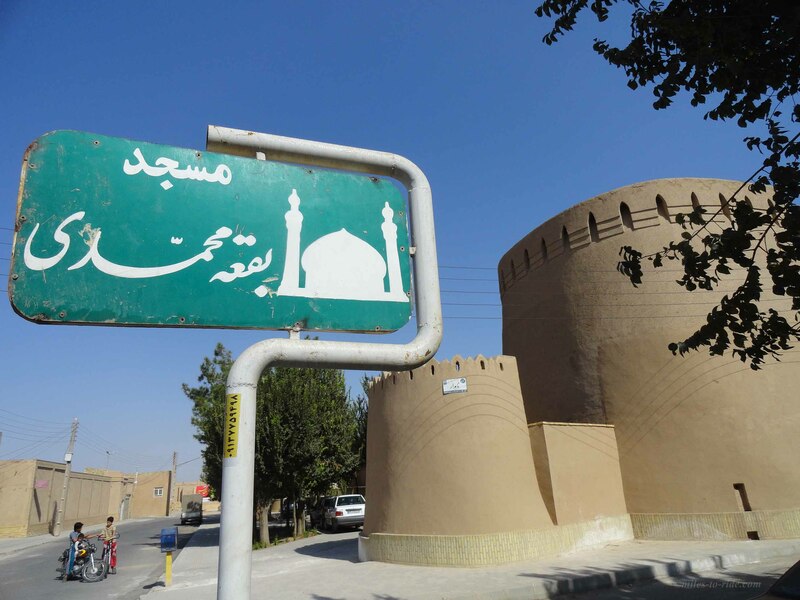 Yazd is supposed to be one of the oldest inhabited cities in the world, well, in any case the small alleys of the old town with their small adobe houses are very impressive and different. 37Grad haben wir heute und wir geniessen die Klimaanlage im Zimmer nun besonders, da es die nächsten Tage langsam gen Süden gehen soll in Richtung Küste. Today we have 37 degrees and we are enjoying the air conditioning in the room for now especially since we leave tomorrow to go slowly south towards the coast.